Who's riding oval rings on the road (of any brand), who isn't, and why not? If they were worth it( made a difference) i guess more pros would use them. Re: Who is riding Oval on the road? Absoluteblack wrote: Who's riding oval rings on the road (of any brand), who isn't, and why not? I've been riding Q rings on my road bike, TT bike and mtn bike for 6 yrs. I don't know if I am faster at all but they just felt better as soon I put them on. Other people I know did not like them, so you just have to try them yourself. I had a Rotor crank with Qrings for 3 seasons, back to normal rings when I sold that bike and probably won't get them for road again. Never got used to them when spinning or soft pedaling. Understand why roadies who make their living on a bike use them, great for people with knee or other leg pains, and at the end of races when you feel like your pedal stroke is falling apart they seem to keep you smooth. I think the big draw to oval rings is in high torque situations, punchy climbing, TT's, accelerating out of corners. This why you're seeing a elliptical revival with mtb's, and I think Absolute Black is a big reason why we're seeing this again. It's all about the timing of the ellipse, I get it. I use Wolf Tooth elliptical 1x for CX and probably will stay that way since my pedaling style agrees with that 'timing', off road is really where these goofy rings really shine for me. There's quite a big contingent of elite and domestic road pros that swear by them and that list gets bigger every year. Mostly for part-time use, many switch between round and oval rings from race to race. Good option to have. I am not. Price, poorer shifting and availability are the limiting factors for me. I'd be interested to hear if these have been addressed? Never had a problem shifting Qrings, under load or not. I think there's more opportunity to get front derailleur adjustment wrong the more severe the ellipse, like with Osymetric rings. Wiggins used to drop chains and went back to round rings. I've also read that Froome had to get used to timing his front shifts, but still uses them full time. That's too much for me to swallow, but I'm not a 3x TdF winner so what do I know. As for price and availability; Where do you live, Antarctica? You don't have a mailbox? If your budget doesn't allow to at least try it nothing else matters then. If you do any off road riding with 1x I would highly suggest giving them a try at least, that would be the cheapest and most reliable way to figure out if you like them. Cheers MWC, good to hear from someone whose used them, i get the feeling the OP won't be back now their market research bait is laid... good to hear the shifting is ring dependent, there's no way I'd be willing to learn to time shifts. Mainly by availability I meant price range, although I do get most of my bits through my LBS. last time I looked it was Dura Ace prices when I'm spending 105 money, maybe I need to look again. I do some off-roading, built up a monstercross bike, and I have seen a lot of them appearing at the trails and some in CX racing. I'd need to check sizes as I run a 46T with 11-32 at the back (should be 36 but it's MTB 10 speed and my bar end shifter can only get 9 gears at a push. It's a proper frankenbike!) so I can use the bike on the road but I reckon I could probably drop to a 42T and still manage. Ha! Man, if this thread was really started by somebody from Absolute Black... offer a center lock version of your diamond hubs in more drillings than just 32h and I'll be sending a request to sign dealer forms! To summarize for road, if you already have a good pedal stroke and don't really suffer form any knee or leg issues, oval rings are probably a waste of time, and front derailleur set up can be fussy depending on shape and severity of the ellipse. Froome on the other hand, who has probably the most disgusting pedal stroke I've ever seen on a pro has been quite happy with them for many years, timed shifts and all. I'll avoid road ring so then, I spend most of my time on fixed on the road. I do have an issue for off-road though. I'm running a crank with a 104 BCD and it seems like the biggest ring available is a 36, possibly a 38, which might be too small to be honest. Hmmm, you don't typically see CX gearing on a 104 bcd, but I understand there's nothing typical about that bike. You'd be golden if you had at least a 110. 110/5 + Wolftooth elliptical 42t is my set up. I literally have a box full of 110 bcd crank sets in my garage. If we were neighbors I'd just give you one. That's a kind offer, guessing it's a couple of thousands miles though. 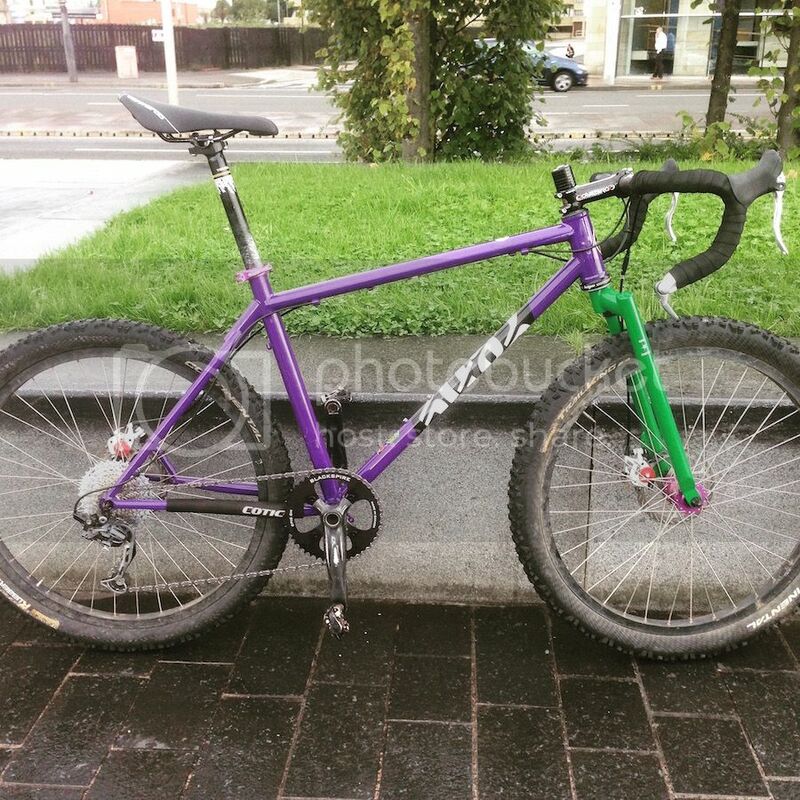 It's an old Deore triple from when it was a proper MTB, trying to keep costs down. I may just get a bit oval and use it when I know I'll be almost exclusively trail riding. Never know, it may be big enough for solo road stuff. Ok, I remember now the bike we're talking about. Hijacked from the *closed disc brake thread. It's INSANE! and I totally want to ride it! You done John Tomac proud, very proud. That's the one! Stack height is sorted now and it has an ISM saddle but other than that it's the same. Brilliant fun to ride. Also, the stopping power of the BB7s is really surprising. I'm not that heavy but I didn't expect them to be as good as they are. King Boonen wrote: I'll avoid road ring so then, I spend most of my time on fixed on the road. The largest 104BCD traction ring we do, at the moment, is a 36. 36 is a pretty decent choice for a single front ring off-road. Depending on your strength, the terrain and the weight of the bike it could be perfect. I'd be surprised if, when mated to a modern wide ration rear cassette, that you ran out of top end (high speed) gear in most UK off-road conditions. Most riders end up with a 32 or thereabouts (our sales and what we see on the trail seem to broadly support this). Interestingly we're seeing more and more CX/Gravel/Adventure/Commute road bikes being specced OEM with lower gearing at both ends. It seems that the misguided passion the industry has had for decades for selling bikes to regular riders that are geared for professional riders is ending. I hope some of this may be of help. Thanks for the reply. If I were only using the bike off-road I think 36 would be fine, but it's been built up for riding on road and off road. 36/11 would top out at around 40kph, which is probably fine for most riding, but for comparison I ride a 53/39 11-25/28 around the west coast of Scotland (when I use gears), I'm a pretty low cadence rider, so for me it's going to start topping out around 35kph which is too small. In its current build state the lowest gear I can get is 46-32 and once some mud has built up that can go up to 46-28 (9-speed road bar-end shifter, takes a lot to get 9 MTB gears out of it) and that suits me ok for trail centre trail climbing but can be too big for more natural stuff. That said, I have been using the bike mainly for off-road riding and was planning on getting a smaller gear for the more MTB type riding I'm doing. I think a 36T would work for that so I'll give the oval ring a go for that. I've noticed the release of the super-compact 48-32 recently. I can see the appeal for off-roading but not for road riding. If you can't ride a 34/32 up basically anything then in reality I think you need to get fitter. I think a single ring at the front and a wider range (but still sensible, not those silly 10-50 10-speed things) cassette at the rear is a much better idea than these super-low gearings. I use the original oval rings called the BioPace from Shimano on one of my older bikes. The BioPace is not as dramatic of an oval as the modern Q rings. I've never used the modern version so can't speak about those but the vintage BioPace does seem to smooth out the pedal stroke just a tad, and supposedly is better on the knees but since I don't suffer from bad knees while biking (I do while running) I can't tell if they're good or the same for knees as round rings. What's weird is that while RotoR claims their chainrings are elliptical and the BioPace were asymmetrical they both claim to do the same things: A, be more efficient, and B, better for the knees. I personally think that RotoR stole the limelight from Shimano, because if you lay a BioPace gear over the top of a Q Ring it's the same exact design! And by moving the BioPace two bolt holes over from Shimano's original spec'd location the BioPace is now in the exact same orientation as the RotoR is! And once I discovered that and I moved mine lo and behold it did work a tad better than it did from it's original position. So RotoR is basically lying in their marketing about the differences, they're exactly the same thing only they look different. Shimano can't sue for patent infringement since the patent ran out after 20 years from the filing date which was sometime around 1982, then RotoR came by and filed a new one in 2006...for what? they didn't invent it, for the fact they moved the ring 2 bolt holes? and some gobbledegook words? LOL. I don't understand the complexities of patents but that just doesn't seem right to me that RotoR could get away with that. Supposedly with oval rings the front derailleur won't shift right sometimes, I never had that issue either in the BioPace original location or after I moved it, so not sure why some people are saying that. All in all I think there is some minor merits to oval chainrings, but I use mostly round chainrings and have no desire to convert all my bikes to the Oval rings. I'm thinking of upgrading to oval, not least as I find 52x11 isn't enough for some terrain out here (I know the ol' pedal faster theory, but I seem to be a low cadence (high 60s-low 70s) guy and the roads here are velvet smooth and in a huge wind trap - I generally ride flat TT). All little intangibles or anything - positive/negative - that would actually change my riding? Ok, after not riding my BioPace equipped bike for about a year I hopped on it the other day and found something interesting. I discovered that my average cadence went up between 10 to 15 rpm's vs round rings, and the higher RPMS was smoother than trying to do the same thing with round gears. I didn't remember that when I wrote the above post, nor was I really paying any attention. I don't have a power meter so I can't say if I was getting more watts, and comparing the two bikes isn't an apples to apples thing since the bike with the round rings weighs 17.4 pounds with aero wheels, while the one with the Biopace weighs 21.8 pounds with box rims. However having discovered that hasn't changed my mind to switch to oval rings, I think the companies selling this technology are way overcharging for the rings. I'm not sure what the differences are between q rings vs osymetric, but if you type "q rings vs osymetric" you will get a lot of information that may or may not be helpful.